The teaching of Christianity can be "incoherent" or "too stereotypical", an academic leading a project to improve lessons in English schools has said. Lessons can lack "intellectual development", said Dr Nigel Fancourt of Oxford University. His comments follow a poll finding widespread support in England for teaching about Christianity in schools. Richy Thompson of the British Humanist Association said schools should also reflect non-religious world views. Some 57% of 1,832 adults polled agreed that learning about Christianity was essential for children to understand English culture and way of life and 44% said more attention should be given to its teaching. More than half (58%) said it was important for children to know about the history of Christianity, major Christian festivals (56%) and how it distinguishes right from wrong (51%). 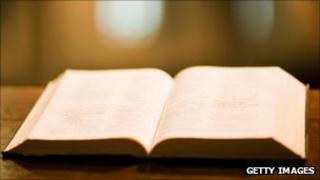 The poll is part of a project to help schools teach the faith in a more rigorous way. Researchers from Oxford's department of education say their focus on Christianity stems from a legal requirement that English schools should reflect the fact that Christianity is the country's main religious tradition. This means that Christianity "will probably be the only religion that pupils study throughout their schooling. It is treated in the same way as other religions but studied more frequently", said Dr Fancourt. In 1534 Henry passed the Act of Succession and then the Act of Supremacy. These recognised that the King was "the only supreme head" of the Church of England. 1553: Mary I - known as bloody Mary, reintroduces Catholicism to England. Many Protestants are executed. November 5 1605: Catholic plotters try to kill James I by blowing up parliament. The failed coup is known as the Gunpowder Plot. But the emphasis on Christianity in religious education (RE) lessons does not mean that teaching is always "challenging and vibrant" say the researchers. Dr Fancourt told BBC News lessons that some teaching was overly focused on faith or moral development. For example he said a lesson on the Bible story of Jesus feeding the 5,000 could become "an exhortation to share your picnic rather than a discussion of whether miracles really happen or what significance they have for Christians today: for example those who say they have been miraculously healed or pray for healing". The opposite side of the coin is teachers who are nervous about tackling Christianity as a subject in case it is considered evangelising, say the researchers. The team are working on a free web-based introduction to teaching Christianity which is aimed at trainee primary teachers. It should be available by September 2013. Andrew Copson, of the British Humanist Association, agreed that Christianity is often poorly taught but said the same thing was true of non-religious beliefs such as Humanism. "Christianity should be taught about and taught about well but not, as at present, to the exclusion of other approaches to life and not in any pretence that it is relevant to the developing beliefs, values and life stances of most young people, over two-thirds of whom have non-religious worldviews." Mr Copson also said that the poll showed that people in Britain primarily viewed Christianity as a matter of history and cultural heritage rather than as a matter of religion. Paul Bate of the European Educator's Christian Association said accurate teaching about Christian beliefs was of paramount importance in the teaching of RE. "The UK is overwhelmingly Christian and young people need to have a clear understanding of what are the central Christian beliefs, values and practices. They should always be given opportunities to evaluate and reflect upon what they have learnt which according to the report has been sadly lacking in many lessons." John Keast, of the Religious Education Council of England and Wales, welcomed the project: "For several years inspection reports have shown that the teaching of Christianity, which is a key part of the RE curriculum in our schools is too weak. "With almost total withdrawal of government support for RE, it is good to see a major university project, sponsored by charitable trusts providing a positive way forward."